The Nerlynx needs your help. 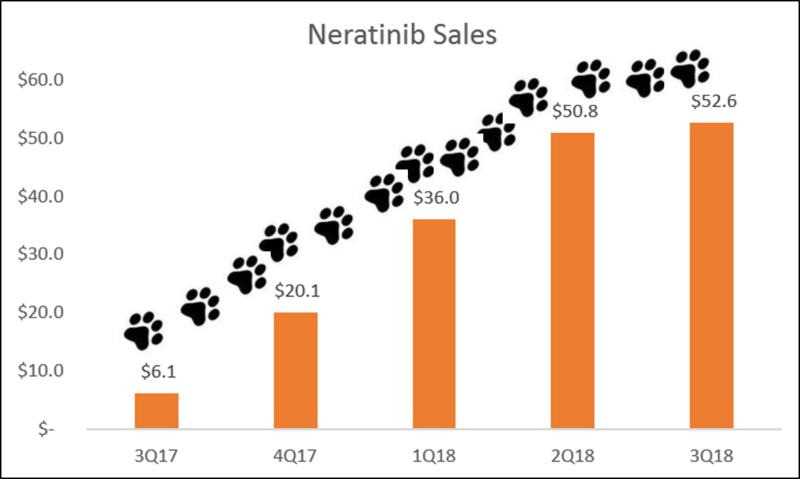 On their 3Q earnings call, Puma Biotech presented brutal sequential sales for neratinib, tanking the stock, hopes & dreams, etc. That’s a 3.5% increase from 2Q18 to 3Q18. This is not the story for, say, Perjeta, which was initially launched in the small market of first-line HER2+ metastatic breast. A year out from its introduction, in an equivalent period as referenced above, sales increased 34.5% over the previous quarter. Six years later, after having picked up approvals in the adjuvant and neoadjuvant settings, Roche reported Perjeta sales of CHF 2.0 billion ($2.0 billion) for the first nine months of 2018, which is a 24% increase year-over-year. Kadcyla, another HER2+ drug which is still only approved for use in metastatic patients, grew 30.8% between its fourth and fifth quarters on the market and has booked CHF 728.0 ($743.3 million) in sales so far this year, an 8% increase over the prior-year period. Deviating from HER2 for a minute, Ibrance was launched in first-line, HR+ breast and was growing 36.2% a year from launch, only to report nearly $3 billion in sales in the first nine months of 2018, even as U.S. sales are being impacted by increased competition. This is just an illustration of the growth trajectory that can be expected with a new breast cancer drug managed correctly. Puma’s performance is not normal. They continue to promise that Europe will deliver revenues, but there was one tidbit in the earnings call transcript that I missed before: their proposed label in the EU market is ER+, HER2+ patients, while in the U.S. it’s all HER2+ patients (about 20-25% of the 260k new U.S. breast cancer diagnoses each year). I checked the APHINITY demographics and was surprised to find the ER+/HER2+ cohort was as big as it was – about 64% of patients in that study (compared to 57% in Puma’s own EXTENET) – but they’re still losing a big chunk of the market. Whether the drug will get any traction in the conservative EU market is a different issue, but when Americans are skeptical, what does that tell you? Still no news on NALA in the metastatic setting, aside from reiterating that it’s going to be 4Q this year or the first half of next year. No urgency, it seems, though at this rate Kadcyla could be approved in the neoadjuvant setting before we even see NALA, further eating away at the utility of neratinib. For an anecdotal example of what Puma’s extended adjuvant delusion is costing them, my own doctor had a HER2+ metastatic patient with decent systemic control and progressive brain mets. Whatever I think of Puma management, we have one drug in breast cancer that passes the blood-brain barrier. Tucatinib is coming, but at the moment, if you’ve failed Tykerb, neratinib is the only marketed option. My doctor was worried insurance wouldn’t pay for it because of the early-stage label. I said of course they would. It’s in the guidelines. She had no idea what I was talking about. I pulled up the press release about neratinib being added to the HER2+ CNS guidelines on my phone. I only knew about this because I stalk the company. An actual doctor who needs the drug available had no clue. This is how Puma thinks things should be done. Insurance apparently said yes to the neratinib request on the first go, and the patient is on it now, so you’re welcome, guys. The unmanageable diarrhea came up on the earnings call, as it always does, and the keyword remains compliance. Puma assured investors that the specialty pharmacies are sufficiently hounding patients to refill, that they’re offering vouchers for loperamide, and that they’re working to get budesonide and colestipol prophylaxis added to the label (so many drugs for these patients!). What is the rationale? The patient is waffling on refilling their prescription, because, you know, there’s nothing wrong with them, and it’s the free Imodium that persuades her? Like the free hat when you sign up for the low-rent gym in the shopping center parking lot? I can’t think of another management team so out of touch with their own market. How many Puma staff and affiliates are charged with pressuring healthy patients to take unnecessary meds versus reaching the prescribers and patients who could actually benefit from neratinib – and have every motivation to take the drug as prescribed, with the hope of refilling all the way through improved OS?